I wanted to share two new ideas I've tried as snacks that fit the Primal way of eating. They are both yummy, full of good healthy fats, and satiating. It only takes a small serving to feel satisfied, but they *are* calorie dense, so either make these in single servings or portion them into baggies if you can control yourself! 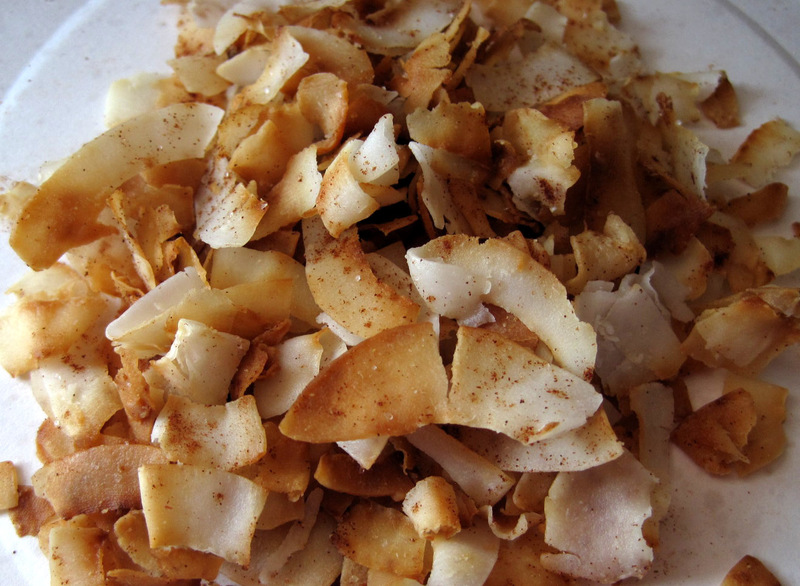 First, Caramelized Coconut Chips. I got this recipe idea from here. It's very simple. You just heat up a nonstick pan on medium-high heat, throw in a single layer of coconut flakes, and then stir and shake them around a bit until they start to toast a bit. It takes about 2 minutes. You can hear the coconut oil sizzling if you listen carefully! It smells wonderful. When they are crisped and toasted to your desired degree, dump them on a plate and toss with a little cinnamon and sea salt. Yummy! You can also make this with a few sliced almonds added prior to heating. Experiment with seasonings... lots of different choices here! I bought my coconut flakes at the health food store. It cost $1.80 for a medium sized bag. Make sure you get plain, unsweetened, real coconut flakes, like Bob's Red Mill or Let's Do Organic brands. The flakes take a long time to eat, so you can savor them. Good stuff! My other new snack, or rather dessert, is dark chocolate pepita bark. I love to put pepitas (pumpkin seeds) in my salads, but this is great too! The ones I have are roasted and salted, but you could use raw ones I think, adding a sprinkle of seas salt for yum factor. 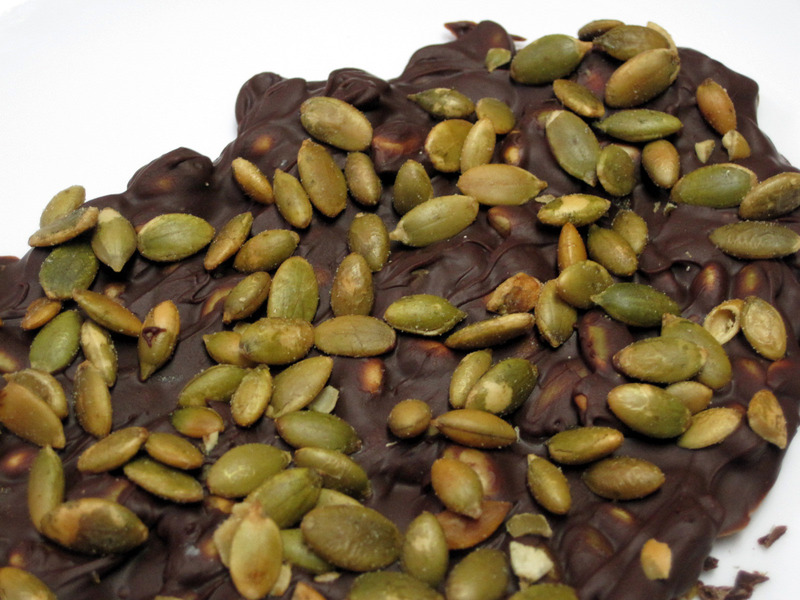 I just love the crunch of roasted seeds and how it contrasts with the smoothness of the chocolate. The best (healthiest) chocolate to use is dark chocolate; I have used 72% (pictures) and 88% (awesome!) All you do is melt the chocolate, stir in some pepitas, spread it on wax paper, and sprinkle more pepitas on top. The nice thing about this is that you can make a small single serving by melting just one square of chocolate and adding pepitas to it. That way, you can't go overboard. It's a nice, healthy indulgence and a great ending to a Primal day. You can read more about the health benefits of dark chocolate on Mark's Daily Apple, home of the Primal Blueprint. If you have a favorite healthy Primal snack, please share it in the comments! I am always looking for new ideas. Both of these look so good. Thanks Lyn! I read Mark almost daily. His site is so intelligent and upbeat. He really understands and respects the whole personal adaptation effect. Any question? One search on his site and theres an article. Having a primal dinner party for 50? Bam, recipies galore! Pumpkin seeds actually can reverse hair loss. They are an excellent source of minerals needed for skin, hair and nails. I had thinning hair related to my weight loss (72 pounds) but eating 3 tablespoons of pumpkin seeds every day reversed it. I have my thick hair back and am still losing weight. Thank you for the recipes.